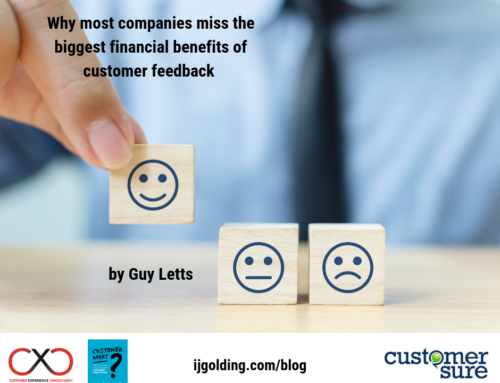 As a result, the Customer Experience discipline is most definitely NOT a tick, or check box exercise! Whilst it is tempting to use a multitude of tools and complete a whole series of tasks, like most things in life, let alone business, you do not do something simply for the sake of it! From the creation of customer personas, to visions, missions and values, businesses spend so much time working on things with great intent, only to fail to actually use or apply them. Too often, we are lulled into the belief that things MUST be done, even if we do not quite understand exactly WHAT it is we are supposed to be doing with the things we create. One of the greatest examples of this in the world of Customer Experience is with Customer Journey Mapping. An exercise that organisations are becoming increasingly and consciously aware of, it is astonishing just how many business have been involved with them over the last few years. Just a simple ‘Googling’ of the words ‘Customer Journey Map’, returns a whole series of beautiful pictures! A collage of customer journey maps! Some are simple. Some are complicated. There is no one way of doing it. However (there is always one of those), the process of customer journey mapping is much misunderstood. Most organisations are creating customer journey maps – with great discipline and vigour. Yet what is becoming clearer and clearer over time, is that despite the process of ‘mapping’ becoming more sophisticated over time (through the creation of prettier pictures), too few are using the mapping of the journey as one component of the art of customer journey MANAGEMENT. Creating a visualisation of the customer journey (which is another description of customer journey mapping), is just one necessary activity to enable an organisation to have the ability to continuously and indefinitely MANAGE the customer journey. Creating beautiful pictures that become ‘corporate wallpaper’ is not the primary objective though! 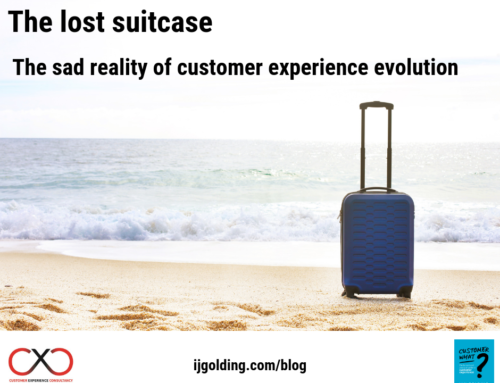 That is why I am actively encouraging – if not urging – organisations to stop talking about customer journey mapping – and instead use the term ‘customer journey management’. So few businesses are using customer journey maps strategically – as a core part of the ongoing management of their organisation. Instead, they see the creation of customer journey maps as a task – something that is done once – never to be repeated again. Do you know who your customer(s) are? Have you mapped the end to end customer journey(s) to represent the current state experience of all types of customer? Have you implemented a measurement system that captures customer perception (voice of the customer) of the end to end customer journey(s)? Have you implemented a measurement system that captures employee perception (voice of the employee) of the same end to end customer journey(s)? 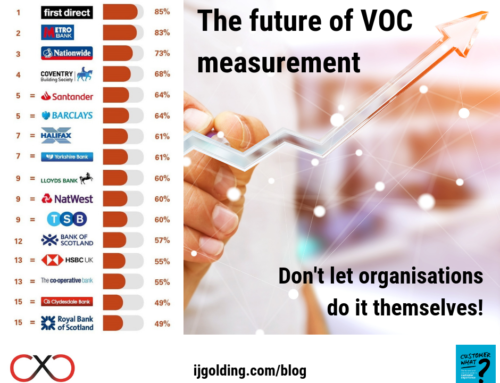 Have you implemented a measurement system that captures the ability of internal processes to deliver the end to end customer journey(s) (voice of the process)? Have you identified accountable process owners for every stage and touch point in your end to end customer journey(s)? Are you reviewing the measurable performance of the customer journey(s) as part of your strategic decision-making review processes (in line with the way you measure business performance)? Is the customer journey(s) reviewed as part of your business planning cycle – monthly, quarterly, bi-yearly or yearly? Are your customer journey(s) maps updated and validated at least once a year? Does every employee in your organisation know the role they play in delivering the end to end customer journey(s)? What is clear from this list is that customer journey management is NOT just about mapping the journey. Management of the journey contains a whole series of activities, that if deployed effectively, will enable the continuous improvement of it. If your organisation is not doing many of the things described in this post, then stop talking about customer journey mapping. Encourage your business to think about the continuous management of the customer journey – that simple change of mind-set is likely to lead to you maximising the benefit of one of the core Customer Experience competencies. Thank you for raising the topic to the strategic level that people need to view it at. 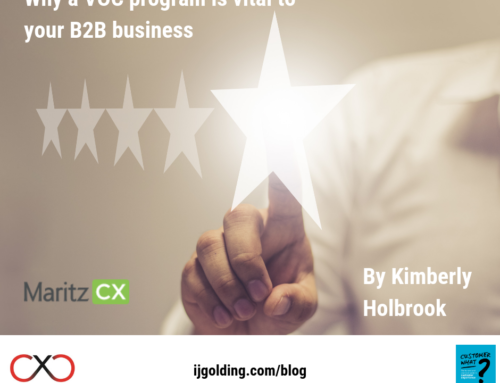 Differentiating between the activity and the management of client journeys, contributes significantly towards anchoring CX practices as a business enabler, and not merely operational-level activities. Many thanks Jacques – much appreciated! Customer journey mapping involves teams who implement the process to deliver the product/service etc, and are interested in things that can be measured internally (eg number of hand offs to resolve a complaint, number of days to offer the product etc) These are the issues that are important to the business – to make their process work in the best possible way for them, and to make sure it is delivered as cost effectively as possible. And rightly so. What needs to be remembered though, is that those on the receiving end do not always value what the process engineers deem to be important in the business. So it is important for the end user point of view to be overlayed on the journey map, identifying pinch and pleasure points from their point of view. Why measure how satisfied someone was with how many days it took, when what is important to the customer is you have lost me my dream home because you didn’t get your act together and get the surveyor out quickly enough? Savvy researchers are needed to extract more than the cliché issues around customer experience to really get to the crux of the matter. In some organisations, there are also root cause analysts, who seem to take complaints, and state that where the organisation needs to focus its efforts is on the most frequent complaint mentioned. In my experience, this is done without any understanding of what proportion of customers make a complaint at all, and whether the complaints worked on are important or otherwise. Because it is cheap to collect data, and it can be said to be direct from the customer however, it seems to be the short cut to mapping pinch points.